The Federal Government has stated its resolve to assist Cross River State in realising it’s economic aspirations embedded in its proposed Deep Sea Port project and other tourism attractions through ensuring that it’s major roads are of quality standard. 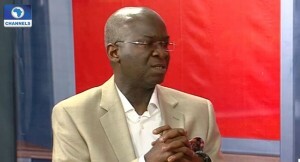 Minister of Works, Power and Housing, Babatunde Fashola, made the pledge while in the state on inspection of highway projects in the south-south zone of the country. Meanwhile, the Contractor handling the project, SERMATECH NIG. LTD. has asked for more funding in order to deliver on the project as at when agreed upon. The Project Manager, Ismon Ewah, also lamented that: “The only challenge is the funding, we have not received up to 50% of demobilization. What we have been trying to do so far is capacity and commitment which the minister has promised to address”. Fashola, however, said that he was pleased at the level of work currently done and assured the contractor of more funding in order to meet up the stipulated time frame of delivering the project. “Irrespective of the tough times, this administration is able to keep the contract there and we have paid some money. It will take some time to finish the road but it can now be managed”. Fashola said.